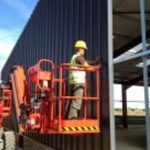 CMS Contractors offer the supply and installation of industrial / commercial roofing and cladding in Staffordshire and across the UK. With over 15 years experience in the roofing trade, we are more than capable to carry out all types of roofing projects - large or small. Single Skin systems are most commonly used for buildings that do not require to have thermal properties ie. animal stables and agricultural buildings etc. The drain drip-stop anti- condensation sheets and fiber cement big 6 profiles being the most common used in the agricultural sectors. Twin skin roofing and cladding consists of two layers of profiled metal sheets, separated by a metal spacer grid with the void between packed with loose insulation quilt. Traditionally twin skin profiled sheets are through fixed, but some secret fix including standing seam can be classed as a twin skin system. Composite panels offer the option of a flat or micro rib finish. The insulation in these panels is applied at the factory and is sandwiched in between the lining face and the weathering face. This can have benefits of faster build times and a smoother finish to the cladding element of the building envelope. They have the additional advantage of achieving the required u value at a lesser thickness. Over-cladding can be adapted for most pitched roofs and cladding. 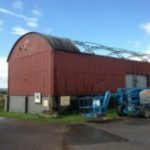 This means the original roof or cladding remains in place providing weather protection, it is cost effective providing a new roof with the minimum of disruption to your business beneath. 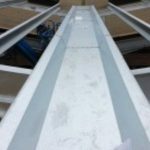 A spacer bar system is installed to support the chosen and desired finished sheet profile. Over-cladding also provides an ideal opportunity to put in place additional insulation, therby reducing heat loss and making it more cost effective in the long run. CMS Contractors specialise in Staffordshire and across the UK. 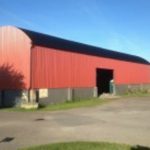 We have expert knowledge in the area and can offer sound advice as to which roofing and cladding specification best suits your needs. 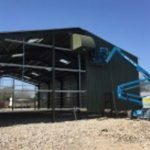 From farm buildings to equestrian buildings; be it a new build, repair or replacement, we believe we can offer you the very best in price and quality. Many buildings need a source of natural light therefore have roof-lights installed. These can be of various materials and profiles. Defective and aging roof-lights can often be the cause of roof leaks. CMS Contractors has many years experience in replacing and maintaining all types of roof-lights. Defective or aging gutters can cause serious leaks into buildings. Our Knowledge of the refurbishment market ensures that the correct solution be applied to eradicate the problems. Many gutters become overloaded during rain storms that occur in today's climate, resulting in serious and damaging leaks. In most cases these problems can be fixed.